A coworker likes to say, “It’s never boring”, and around our house, that’s an appropriate phrase. This week we made a radical jump: no more cable television. Yep. Cut the cord…or cable as it were. While we have a few issues with Verizon since we moved back to the states in 2007 (their customer service is deplorable), this one was totally on us. We haven’t really been watching television, save for a couple of shows, for a long time and to pay the amount of money we were shelling out for a DVR and two set tops boxes and no movie channels was absurd. We DVR’d two shows for everyone (The Big Bang Theory and Modern Family), Once Upon a Time for Drew (though I would watch it with him), NOVA, and a few shows for Andrea that she never seemed to have time to watch. Not worth it at all. As with many of life’s changes, Andrea makes the decision first…and I more often than not must socialize the concepts for a while before I come around. And when she sets her mind to something, she runs with it. She can spend a couple of long nights researching options and then one day I come home to a small box on the counter containing something even smaller that I have to figure out how to make work for us. 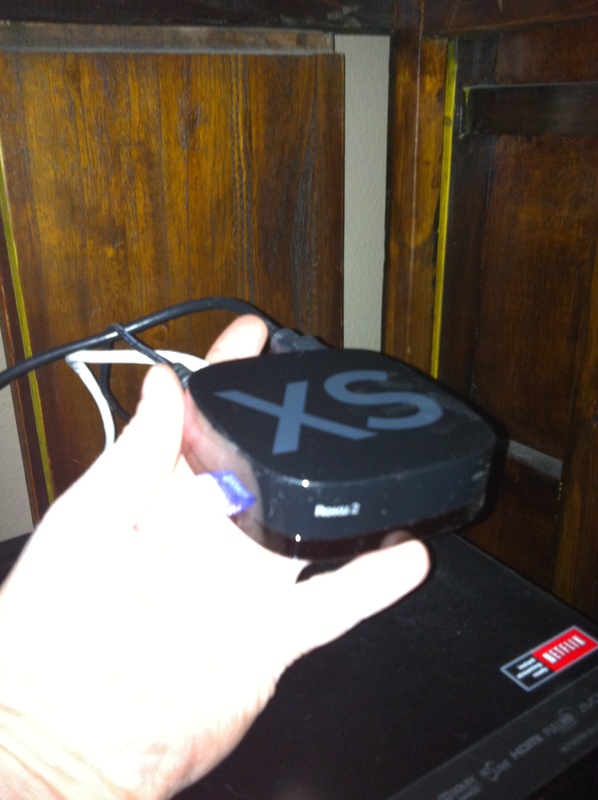 The magic little device is a Roku streaming player. And little it is, as you can see in the picture. Andrea looked at Apple TV, but we nixed that pretty quick. Too many limitations – content, recurring costs, etc. and it’s wedded to the dreaded iTunes. To be fair, Roku and Apple TV do have a common limitation that I hope someday somebody will figure out: neither can stream from VIDEO_TS folders. DVD content has to be converted into something palatable. Connecting the Roku is simple. HDMI cable into our receiver, network cable from the router (they do have wireless versions as well.) That’s it. Then you start setting up your channels. They make it pretty painless. Now, some of the Roku channels might require fees – Hulu Plus is one we’re looking into – but the rates per month are fractions of what Verizon was charging us. How many readers remember television antennas? All but forgotten I’d venture. It probably never occurs to the aluminum foil hat folks worrying about cell phone radiation that they are being bombarded with a constant stream of digital over-the-air broadcasts. But all those local television stations make their content available to anyone with an antenna and a digital decoder.